Many students underestimate the difficulty of multiple choice exams - after all, the answer is there somewhere. But there are a few good ways that students can prepare for multiple choice exams including identifying potential questions, making up practice questions, learning to pace themselves during the exam and learning how to make an educated guess if they are unsure of the correct answer. 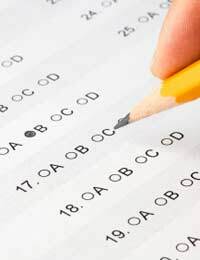 Multiple choice exams usually offer four or five options for each question, so the answer options tend to be items that are easily translated into bullet points. Facts like names, dates, titles, locations, terms and definitions are often used as the answers to multiple choice questions. However, on many multiple choice exams the answer options are only marginally different (for example 1992, 1993, 1994 or 1995) so students must be sure to pay attention to details when studying for multiple choice exams. Students must also be able to separate factually correct answers from the best answer for the specific question since many multiple choice tests contain answer options that are all correct, but not all the best match for what is actually being asked. Probably the best way to practice for multiple choice exams is to work on practice questions. It can be hard for students to make up practice questions for themselves, but members of study groups or groups of friends could each make up practice questions that others could work on. Regardless of who ends up writing practice questions, the questions should help students study the information they may find on their exam as well as get used to the various question types that they might encounter. True or false questions, double negatives in a question, questions that require students to apply knowledge to work out an answer, questions that require students to select the untrue or not applicable answer and questions that use phrases like "which of the following" or "complete this statement" are all commonly found on multiple choice exams. Some students become their own worst enemy during their actual exams. For these students, practising how to pace themselves during an exam is important so that they can learn to stay calm and get through all of the questions. Taking a few deep breaths, reading the instructions carefully and browsing through the exams to see how many parts and how long they should spend on each can all be ways that students take back some control during their exams. Many students also like to go through their exams once in order to answer all of the quick and easy questions, and then return to the harder questions that will require them to slow down on a second read-through. While practising for multiple choice exams, students should practise how to make educated guesses when they don't know the answer. This may mean reading each answer option and deciding if it is true or false, looking for the best option for the question being asked and looking for answer options that are true and contain specific vocabulary linking them to the question. For some questions students can even use common sense for narrowing down the potential answer, such as when they know that one option is wrong and therefore the option stating "all of the above" can be eliminated as well. The more answer options that a student can eliminate, the closer (s)he gets to the best, correct answer. Multiple choice exams can be tricky. Identifying potential questions, making up practice questions, learning to pace themselves and learning to make educated guesses are all ways that students can prepare for multiple choice exams.